This dish was inspired by a friend who serves spring rolls stuffed with tinapa and kesong puti, and a pancit palabok that was garnished with sliced kamias. 1. Rehydrate noodles in boiling water with a little chicken stock. 2. In a wok, sauce garlic with just over half of atsuete oil until it becomes pale gold. Add tinapa flakes and continue to sauce until everything is fragrant. 3. Add noodles and toss until tinapa and garlic are well mixed, and noodles are coated in the oil. Add some chicken stock and more atsuete oil if it looks too dry. Season with salt and pepper. 4. Add burong mangga and half of the cilantro.Toss to mix. 5. 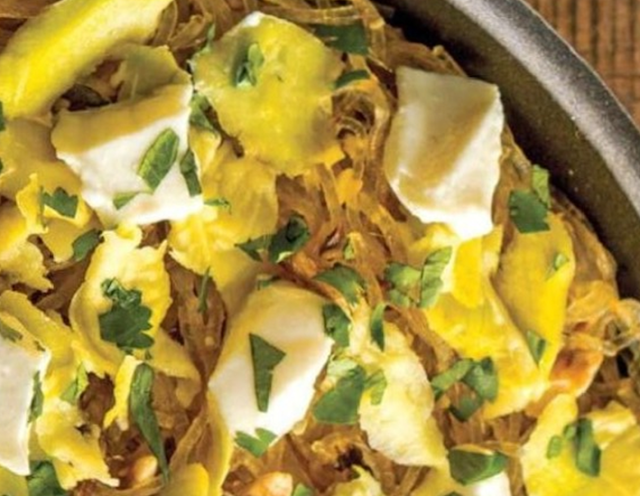 Serve topped with more burong mangga, the remaining cilantro, and the kesongputi. Drizzle with remaining atsuete oil, or serve on the side.